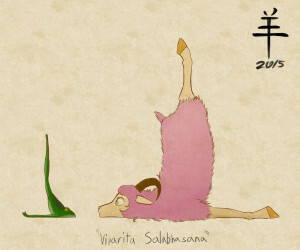 Goat yoga is a thing. Look it up. Modern Farmer magazine describes it as yoga…with goats! Is goat yoga ‘authentic yoga’? It’s unlikely, but London Astanga boss Hamish Hendry told a discussion on authenticity in modern yoga, held at Triyoga in Camden, that he’d found 30 different styles of yoga on Triyoga’s own website. Are they all ‘authentic’, and what is this authenticity that people seek? Sitting with Hamish to chew over this knotty authenticity problem were senior Iyengar teacher Alaric Newcombe, Anasura UK representative teacher Bridget Woods-Kramer and Yoga Alliance-registered senior teacher Anna Ashby. As Hamish argued, a good starting point for authenticity in yoga is not to get angry if ‘your’ style of yoga is criticised. He cited the Bhagavad Gita where Arjuna is told to abandon all attachment to success or failure. “This equanimity is called yoga”, Arjuna is told. All the teachers agreed that some form of spiritual development must be considered a key component of authentic yoga, despite the modern, western, emphasis on physical postures. Alaric Newcombe said BKS Iyengar specifically set out to teach a spiritual discipline in a secular western setting, intending to convey Patanjali’s yogic disciplines of pratyahara, dhyana, and so on through asana. Alaric told the discussion that he himself practices asana to get to some approximation of samadhi. Physical poses are a way to experience expanded awareness or deeper connectivity but not the only way, he said, and Anna Ashby agreed that the body can be a doorway to mystical experiences of some kind. But you have to ask whether you are approaching a pose simply to get your foot behind your head, or whether you are present at every stage of the process, she said. It’s tricky to have any kind of discussion of yoga’s authenticity without mentioning the G word. It may the demographic from which most yoga practitioners are drawn but any mention of God in a yogic context is inevitably controversial. Patanjali talks about God a lot in the Sutras, although quite what constitutes God is open to debate. Hamish told the debate that yoga can help you control the senses, if you can control the senses you can control the mind, and if you can control the mind then maybe, just maybe, you can see God. One key question not really touched on in the Triyoga discussion must be the relevance of yoga’s authenticity. The Astanga sequences may come from the Yoga Korunta, or they may have been drawn up by Krishnamacharya and adapted by Pattabhi Jois, but does it matter? If thousands of people worldwide take daily benefit from a system, and some even delve beyond the asana then maybe that’s enough in itself whatever its origins. Most yoga practitioners would accept there’s a definite focus on physical ‘achievement’ in the vast majority of western-taught yoga, but maybe the stillness at ‘authentic’ yoga’s heart is more obvious than many realise. Hamish told the Triyoga discussion that he recently asked his 11-year-old daughter if she wanted to do some more yoga, have tried a little as a small child. No, it’s too hard, she said. Why’s that, too physical? Her dad asked. No, you just have to be still and do nothing, she replied.